This screen is accessed from the back-end Joomla! administrator panel. It is used to manage banners which can be displayed on your Joomla! website. Select Components → Banners → Banners from the drop-down menu of the Joomla! Administrator Panel. You can also select the 'Banners' menu link from the Banner Categories Manager, Banner Clients Manager or the Banner Tracks Manager. The Banner Manager is where you can edit existing Banners and create new ones. You can also easily enable or disable banners from this screen. From this screen you can navigate to the Banner Categories Manager, Banner Clients Manager and the Banner Tracks Manager. You must add at least one Banner Client and Banner Category before you can add a Banner. Click on the column heading on the banner manager screen to sort the list by that column's value. Name. The name of the Banner. You can click on the name to open the Banner for editing. Sticky. Whether or not the Banner is "sticky". If one or more Banners in a Category are designated "sticky," they will take priority over Banners that are not sticky. For example, if two Banners in a Category are sticky and a third Banner is not sticky, the third Banner will not display if the Banner display module setting is "Sticky, Randomize" or "Sticky, Order." Only the two sticky Banners will display. If the sticky banners have a fixed number of impressions, once those impressions are used up, the sticky banners will no longer display, and the non-sticky banners will begin displaying automatically. Impressions. The Impression count is the number of times the Banner has been displayed on a page. The first number in this column is the actual number of Impressions so far, and the second number is how many Impressions were purchased by the client. Clicks. The first number is the total number of clicks that have been made on the Banner since the counter was reset. The second number is what percentage of the time user clicked on the banner when it was displayed. Meta Keywords. Optional meta keywords to be used for displaying specific Banners based on the content of the Article being viewed. If the Banner module Parameter 'Search By Tag' is set to 'Yes', Banners whose Tags match the Keywords entered for each Article will display when that Article is being viewed. You can filter the list of items by typing part of the banner's name. Select State. Use the drop-down list box to only show items matching a certain state: Published, Unpublished, Archived, Trash or All (available options may vary depending on item type). Select Client. Use the drop-down list box to select only banners configured for the selected client. Select Category. Use the drop-down list box to select the desired Category. Only items in this Category will be displayed in the list. Select Language. Use the drop-down list box to select the desired Language. Only items for the specified language will be displayed in the list. Click the Options button to open the Banner Manager Options window which lets you configure this component. Save & Close. Saves changes and then closes the Options window. Save. Saves changes and keeps the Options window open. Cancel. Closes the Options window without applying changes. Track Impressions. Whether or not to count how many times a Banner is displayed. Track Clicks. Whether or not to count how many times a Banner is clicked. Meta Keyword Prefix. When matching keywords (for matching Banners to Articles based on Keywords), only search for keywords with this prefix. This can improve performance. The tree on the left shows the hierarchy of user groups that are available on your Joomla! site. 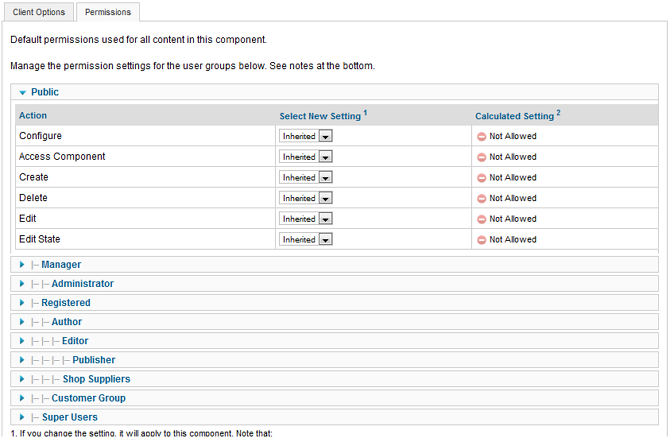 To view or modify permissions, click on a group in the tree. Actions. The various actions for which you can specify permissions for the currently selected user group. Inherited. The permission for this group/action is inherited from the site's Global Configuration. Allowed. Allows this action for this user group and for child groups. Locked. Denies this action for this users group and for child groups. Calculated Settings. The effective permission, based on current options in the site's Global Configuration. Note: After making changes, Save options and open them again to view updated Calculated Settings. Configure. Grants users the right to edit this component's Options. Access Component. Grants users the right to open this component's main screen ("Manager" screen). Create. Grants users the right to create new objects (for example: users, menu items, articles, weblinks, and so on). Delete. Grants users the right to delete existing objects. Edit. Grants users the right to edit existing objects. Edit State. Grants users the right to change existing objects state (Publish, Unpublish, Archive, Check In and Trash). Banners. This link is disabled, since you are already in the Banners page. Categories. Click this link to go to the Banner Category Manager page. Clients. Click this link to go to the Banner Client Manager page. Tracks. Click this link to go to the Banner Tracks Manager page. You must add at least one Banner Client and Banner Category before you can add a Banner. This page was last modified on 28 April 2013, at 18:29.